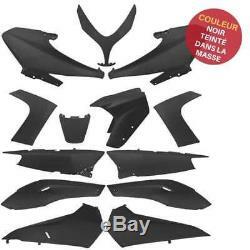 Complete fairing kit 13 parts for Yamaha Tmax 500 from 2008 to 2012. Color: black to paint (black tinted in the mass). Parts adaptable, in accordance with the origin. You will find all these pieces at retail on our site. Tel: (+33) 06 52 786 986. By bank transfer: bank details given on request. By bank check: to the order of "agsp" to sent to the address indicated in contact. Delivery 48h to 72h in relay package (working days). The delivery time may vary depending on the availability of the product. If product in stock it is shipped within 24 hours. If product in stock at the supplier shipped within 5 to 10 days. The delivery time is indicated on the ad. The item "kit careening plastic 13 pieces black black to paint yamaha tmax t max 500 2008" is on sale since Tuesday, May 9, 2017. It is in the category "auto, motorcycle parts, accessories \ motorcycle parts \ other" The seller is "vospieces2roues" and is located at / en fr. This item can be shipped to the following country: France.